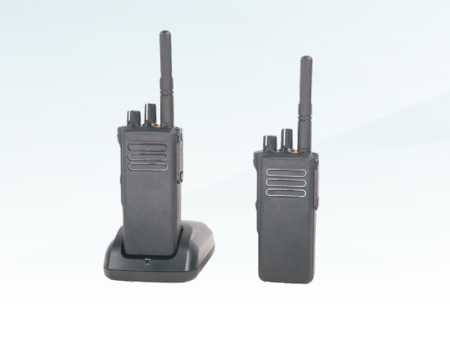 Technical data Explosion-proof marks: Exib Ⅱ BT3 / Exib Ⅱ CT4 • protection level: IP57/IP67 • working voltage: D.C. 7.5v • frequency range: 136~174MHz; 403 ~ 527 • transmission power: < 3.5w • working mode: FM • dimensions :(HxWxT)122x56x39.4 Product features • interphones include enhanced call signaling, option board extensibility, and forced interrupt transmission to help users prioritize emergency communications. The programmable button function is displayed on the display screen for easy viewing and quick access. • when workers need to pay attention, customized voice prompts confirm the functions of channels, regions and programmable buttons with sound, thus eliminating the need to view the display screen; • an antenna with enhanced reception and transmission intensity to expand the signal radiation range; • many channels, you can choose to use channels (1 to 16 channels); • convenient call and answer (in the same channel, press the call button to talk to the other party and release the button to answer the other party's voice); • when the battery power is low and needs to be replaced, an alert will appear (a warning sound will be sounded every 30 seconds, and the LED indicator will flash red light); • note: the charging of the interphone should be carried out in the safe zone. Please pay attention to the user when using it. The product description • streamlined design, compact appearance, advanced function, light weight, easy to carry; • simple and convenient operation, clear and resonant sound quality; • it can be used by a single phone to a single phone, or with a fixed telephone station, forming a wireless amplification intercom system; • wide range of communication, as far as 5km.